Yes, motherhood is all about tricking our children to eat veggies. These waffles give children the healthy foods their growing bodies need in the form of a food that is very kid friendly. My kids gobbled these down asking for more, but enough about how much my little ones liked this…I’m not kidding you, I think this was one of my favorite ways to eat zucchini ever! Not to mention, I love how quick it was to make these waffles, with very little preping and not much clean up. No oven required, I think this will be a perfect recipe to make all summer long. 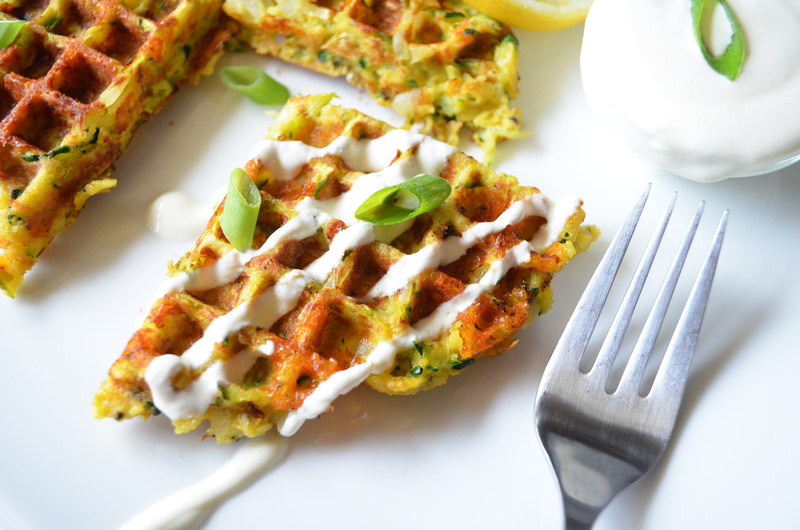 All you need is your waffle maker cutting board, a bowl and a grater for the zucchini, easy enough right? If you’re in the market to find a new waffle maker I absolutey love my All-Clad Stainless Steel Classic Round Waffle Maker . Every waffle is always cooked to perfection and comes out with such ease. The simple lemon cream sauce has two versions, either with sour cream and lemon juice or greek yogurt and lemon juice; whichever your heart and health desires. Just don’t forget to top with crunchy green onion to finalize this perfect dish. For all my peeps with a egg intolerance or allergy visit the Minamalist Baker for a great replacement recipe! OPTIONAL: I added a small amount of ground cinnamon that pairs beautifully with the zucchini, this helped make the dish slightly sweeter and my kids loved it. Check out my Healthy Living page for more Mindful Recipes; recipes that are on the lighter side, but still oh so flavorful!